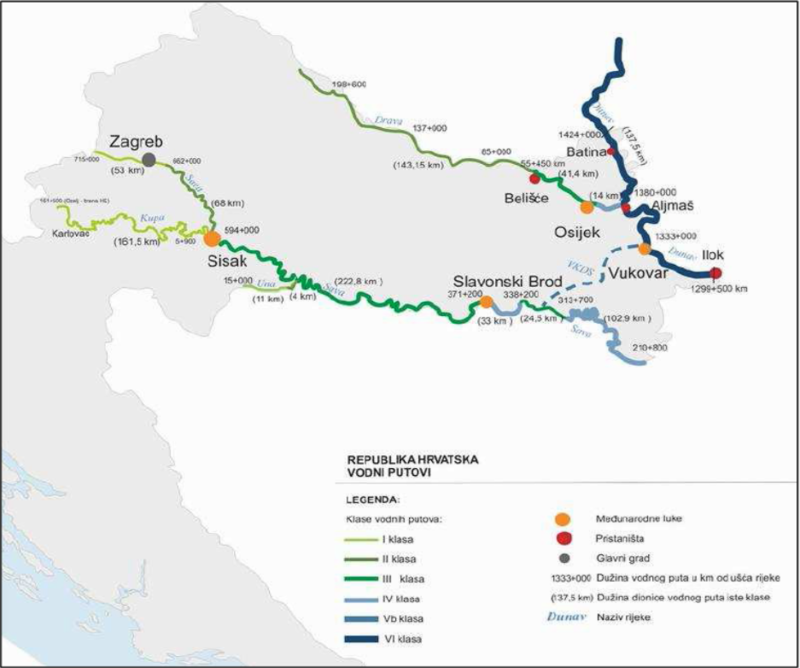 Two Core European Transport corridors pass through Croatia and make it your shortest route between Western Europe and Asia, Eastern Europe and the Mediterranean. Located in Southeast Europe, bordered by Italy, Slovenia, Hungary, Serbia, Bosnia and Herzegovina and Montenegro, Croatia is perfectly positioned for reaching the EU market as well as the markets of Southeast Europe. The main navigable rivers are: Danube, Sava and Drava. In recent years Croatia has invested heavily in developing the Trans-European transport network, primarily roads, motorways and ports. Investments into transport, telecommunications and energy infrastructure will continue in the future, with special emphasis on rail transport. The permanent population of Croatia reached 4, 29 million. The capital of Croatia is Zagreb. Croatian transport infrastructure has been part of the Core European Transport Network, in particular Mediterranean corridor: Port of Rijeka, motorways and railways towards Slovenia and Hungary as well as Rhine –Danube corridor: rivers Danube, Sava and Drava, inland waterway ports: Vukovar, Slavonski Brod, Osijek, Sisak. The Adriatic Sea penetrates deep into the continent, and enables an inexpensive maritime transport to Adriatic ports and, from there, by train, roads, or rivers, to continental parts of Croatia, and to various European countries. In figures, Croatia has around 27000 km of roads in total, out of which over 1400 km are motorways. Furthermore, we have over 2600 km of railways, above 1000 km of inland waterways, out of which over 600 km have been integrated in the European inland waterways network of international importance. 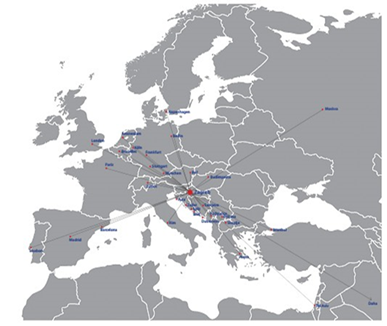 Concerning civil aviation, our airports: Zagreb, Split, Rijeka, Osijek, Dubrovnik and Zadar are well positioned and connected with other transport modes. Croatian intention is to expand utilization of capacities of the maritime ports and play important role in the transport of goods between Europe and Asia. Although as many as 800 million tons of cargo pass each year through the Suez Canal in the exchange of goods between Europe, Asia and Australia, only some 40 millions of tons are actually destined to northern Adriatic ports. 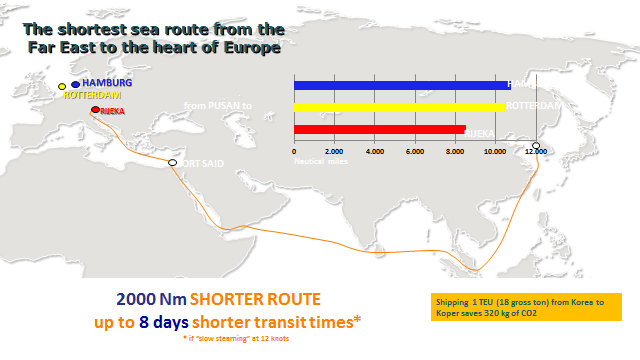 This presents a huge opportunity to our ports, in particular to the Port of Rijeka as a part of Mediterranean corridor as fairly connected to the core railways and motorways network. Croatia has a long maritime tradition and the maritime sector has always played a key role in the economic, trade and social development of the country. Croatian ports handle large amounts of the country’s trade as well as transit cargo, and they play a vital role serving both the public maritime transport and coastal tourism markets. Some of Croatia’s ports have a considerable potential to become major Adriatic gateways to both Central and South-Eastern Europe. According to the official journal, there are 433 ports and small harbors open to the public in Croatia, of which 95 ports with a minimum of one line service. Six major ports (Rijeka, Zadar, Šibenik, Split, Ploče, and Dubrovnik), are classified as a national ports or ports of international economic interest. The main comparative advantage of Croatian seaports compared to other ports of the European Union is the fact that the Adriatic reaches far inland into the continent which ensures the shortest and cheapest transport connection for countries located behind Croatia to the east Mediterranean, and via the Suez Canal to Asian and east-African countries. The majority of cargo traffic in Croatian ports is carried out in the Rijeka and Ploče ports, totaling close to 90% of the total cargo traffic of all Croatian ports of exceptional economic significance. On the other hand, the majority of passenger transport is carried out in the Split and Zadar ports, and Dubrovnik is the port with the majority of traffic of cruising vessels. The development projects that are currently in the implementation phase should define the Croatian ports as modern logistics centers, taking into special consideration the options provided with the accession to the European Union and its commercial market of 500 million inhabitants. Cargo traffic in seaports in 2015 amounted to 19 million tones. In terms of cargo type, traffic in coal and ignites, crude oil and natural gas was the most represented, with more than 30%, while coke and refined oil products were at around 18%. International cargo traffic in 2015 amounted to more than 80% of all traffic. The Port of Rijeka is the Republic of Croatia’s primary cargo port. The port handles a variety of cargo commodities, including containers, dry bulk, liquid bulk, break bulk as well as passenger ferries. The Port of Zadar is small port located in between the Port of Rijeka and the Port of Šibenik. It is primarily focused on RoRo, RoPax ferry traffic. The Port of Šibenik is historically a cargo port, but is nowadays primarily focused on cruise and ferry traffic. Apart from these passengers-related port activities, the port acts as one of the primary import and export ports for Petrokemija Kutina, a fertilizer production company located in continental Croatia. The Port of Split is a multipurpose port and the nation’s number one passenger port. More than a quarter million cruise and nearly 5 million ferry passengers called at the Port of Split in 2015. Cargo throughput amounted to more than 3 million tons in 2015, with commodities such as wood, coal, salt, sugar, oil and derivatives, cereals, cement and clinker. The Port of Ploče is a cargo port that primarily serves the Bosnian and Herzegovinian and Herzegovinian economy. The port handles a variety of cargo types, including containers, dry bulk, liquid bulk, general cargo as well as passenger ferries. It operates in the Ploče Basin, as well as in Metkovic, some 20 km upstream Neretva river. Metkovic is specialised for cement, slag and granulated stone. There are 4 inland waterway ports in Croatia, all situated on the Danube River and its tributaries. 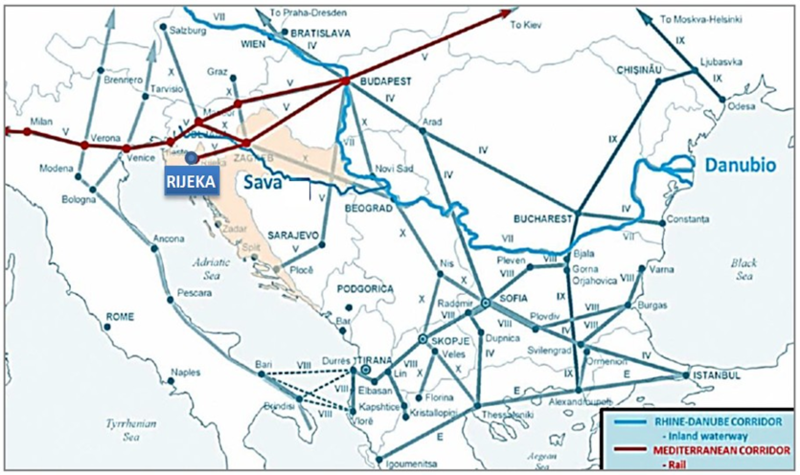 While they are all parts of the TEN-T Rhine-Danube Corridor, the Vukovar (on the Danube River) and Slavonski Brod (on the Sava river) Ports have been classified as TEN-T Core Network ports, while Osijek (on the Drava river) and Sisak (on the Sava river) have been classified as ports of the TEN-T comprehensive network. Port of Vukovar has an excellent connection to its hinterland with direct railway link to regional railway station Vinkovci, that is national hub for this region, and also a part of the corridor X, and it is only 40 km away from the Vc road corridor.The port is operable during the whole year regardless of water level. Across the port area four port operators currently operate transshipping all kind of cargo including bulk cargo, general cargo, liquid cargo, grains and containers. Port of Osijek has a good connection to the hinterland by rail and road and there is only 8,5 km from the Port to the Airport. Due to this facts the Port of Osijek has the capabilities to become an intermodal logistics hub.